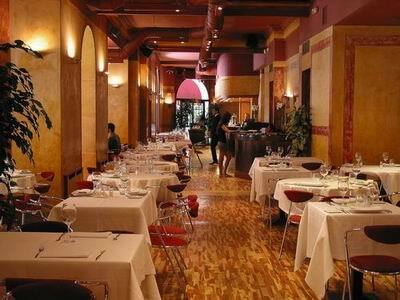 Filo Abascal is a modern restaurant offering Mediterranean cuisine. The average price of a main course dish at the Filo Abascal restaurant is 14 euros. The average price of a 3-course meal at the Filo Abascal restaurant is 46 euros. Note that although GoMadrid.com strives to maintain all information about Filo Abascal up to date, the prices mentioned are only an indication and may not reflect the exact value of your meal. This central restaurant occupies an old building with high ceilings and a decor that mixes classic and modern details creating a relaxing atmosphere. A peaceful 250 seat terrace is the ideal place to enjoy a meal away form the buzzing of the city centre. Fresh pasta & pizza, creative salads or confit duck are some of the proposals for an informal meal that can be finished with any of their home made desserts. The address of the Filo Abascal restaurant is: C/Jose Abascal 44, 28003 Madrid. The nearest Metro station is Alonso Cano. Please see the Filo Abascal restaurant location map below.